Most of us when visiting an unfamiliar area use not only maps, but seek inspiration from guidebooks and magazines. As a reader of “Country Walking” over some 10 years, I have always admired the pull-out supplement of regional walks. And I have particularly appreciated the many walks in Cambridgeshire and Norfolk contributed by Jack & Sheila French of Peterborough. Whilst I might have been familiar with the routes in South and East Cambridgeshire, those in Norfolk were a treasure-trove to us. Sadly, after no less than 174 walks, Jack tells us that they will not be offering any more, partly because it becomes increasingly difficult not inadvertently to use walks already described elsewhere, but mostly because they do not want to drive to the other side of Norfolk and back in a day, to cover the county fully. But the existing walks descriptions remain, treasured in files on many a bookcase, a continuing library of ideas for new excursions, and a reminder of happy days spent rambling. I am delighted to have persuaded this charming, modest couple to give us their history, and the history of how the walks were derived. Thank you Jack & Sheila for giving so much pleasure, and may you continue to enjoy many happy rambles yourselves. Hopefully Cantab Ramblers will have read and enjoyed some of our 174 contributions in Country Walking magazine. We have tried to find something new and well worth walking but in Cambridgeshire that is often difficult. Our writing started after reading early editions. (CW started as a “taster” in Sept. 1986 then went on sale bi-monthly from April/May 1987 priced £1.10). I thought that I could put together better walks than some of those provided. As it was published here in Peterborough I went to see the Editor with one of my proposals. His reaction was that my hand drawn map was ideal, wishing other contributors paid so much attention to detail, and he would use it in the Down Your Way. We then didn’t stop submitting until probably the last one in Ringstead, Norfolk published in May 2003. The Editors do have one more from Gayton Thorpe to Gayton then through the swamp at East Walton, it may not be used as it is rather adventurous and difficult to follow. If it had been known how dry this last summer was to be it would have been quite acceptable & different, so it may be reconsidered in 2004. My wife Sheila has always accompanied me so when pictures were required in August 1992, one of her hobbies being photography, the pictures became her responsibility in addition to doing the typing. First of all the editor accepted anything we provided and we travelled as far as Calderdale, Derbyshire and Leicestershire. Then in 1992 the Editor split the country up between the contributors and we were given Cambridgeshire and Norfolk. We were disappointed as had already prepared a Rutland walk and others were planned. Our thinking is that Cambridgeshire is generally very limited for new good walks: where suitable they are all well covered by other books and leaflets; also in wet weather we tend to avoid them due to the sticky clay. On return from Norfolk our boots seldom need much cleaning, otherwise why do I favour it? I was reared in Wisbech St Mary at the local garage, from 11 years my brother and I cycled three windswept miles each way to Wisbech Grammar School sometimes returning again in the evening to Army cadets etc. Winter life was a continuous round of colds for me, conditions being much worse than today as the water table was almost at ground level and everywhere was so damp. Older folks think that the area is now over drained, but that is digressing. We had uncles farming in Norfolk whom we visited and I always thought the countryside was lovely, with its large hedges, woods and no mud, that’s the place for me I thought! Later, when grown up and in the RAF, as soon as I set out from Peterborough my thinking was I’m never coming back here. But it was not to be, my father died in 1952 and I was released to help my mother to continue the business, just when I had decided to make the RAF and aeroplanes my future. After a few years we sold up with the intention of me continuing in the RAF, but things had moved on and we had a family to consider. I took a temporary job at Perkins Diesel and stayed for 30 years as a draughtsman/engineer. During this time I took up several hobbies, poultry and beekeeping, sailing and golf, but always enjoyed walking and was on the committee of the HF Rambling Club, Sheila being the treasurer for 8 years. We ran coaches and weekends away and the club prospered on a ‘sub’ of £1, programmes being given out on rambles and mainly hand delivered. From these walks we began to appreciate Norfolk even more but haven’t moved house as our two daughters and grandchildren live nearby and give us lots of pleasure We found that I could afford to take early retirement from what was becoming a very stressful job,and in so doing I could pursue my hobby and do a very rewarding job, as walks leader for CHA at Cromer. It turned out to be some of the happiest times of my life assisting so many people to really enjoy their holiday, many being very surprised at the variety of Norfolk’s landscape. We’re asked where is your favourite walk here? Mine is Cromer to Overstrand: check the tides and go one way on the beach and the other along the cliff top. For an extension go up the road by the car park/toilets, left on a path up and past the old station to Northrepps then up and loop down back on the path east of the aerials to the coast road. One may now have to go back into Overstrand via the road, the cliff top path now being too dangerous. Sheila prefers the one from Sheringham west on the cliff to Weybourne. A short walk can be had by earlier cutting inland to Sheringham Park, otherwise continue until the cliff finishes and take the track inland to the road, left and right up the track to cross the railway then left to Weybourne station. Leave by the station footbridge to carry on through Sheringham Park to Upper Sheringham then on to a track to the main Sheringham entry road and back to the start. In Cambridgehire, we think the best is on our doorstep with a selection starting in Ferry Meadows. King’s Lynn ramblers have been by coach three times and been pleasantly surprised at how much they had enjoyed their visits. The last one for example was first go to the entrance to see the wonderfully carved elm tree sculpture, which is not to be missed, then west along the north side of the railway, over the bridge and west along a lovely track, once part of a Milton estate toll road running from the A47 picturesque bridge to Alwalton. At the fence, the old track is blocked off, go down to the riverside then up from an old bathing area, take the first road right back down to the river, left over the backwater and lock, over the water meadow, footbridge and left to Castor water mill. Then either go up the lane and right at the railway bridge for a 4 mile walk or go left beside the garden on Nene Way to take the right stile towards Castor. At the railway bridge one can go right on the start of a cycleway leading back or go under the bridge and into Castor. To return take the path starting east of the church, cross the next lane to take a path curving right to exit on to the main road. Turn left to go first right on the old A47 to Ferry Bridge and back into the park. (8 miles). Stan Hampton, following his recovery from heart bypass surgery, has been pleased to lead a “Walking for Health” group from St Ives every Tuesday and Thursday, for distances of up to 4 miles. The aim is primarily to encourage new walkers, but the short walks are also being found attractive by seasoned ramblers who, for one reason or another, are not currently able to take part in the longer walks on the Ramblers’ Assoc. programme. For more info: phone 01480 466558. Lisa Woodburn draws our attention to a Times article of 26 October by Jonathan Leake. Under a new plan to promote walking, local councils will have the option to rephase traffic lights and Puffin & Zebra pedestrian crossings to give priority to walkers in urban areas. Studies by the Dept. of Transport have shown that the longer the wait for lights to turn in favour of those on foot (currently up to 2 mins.) the higher is the rate of traffic accidents. However, such plans will only apply to urban situations, and don’t get too excited, as the Government’s Walking Strategy has an incubation period of about 6 years….. I recently had the pleasure of attending the 19th AGM of the IWA, held this year at Dalham, Suffolk. Thus, counting the inaugural meeting, the Society finds itself 20 years on. In many ways, its achievements are very solid. A route exists between Ivinghoe Beacon and Knettishall Heath, which is waymarked throughout, and supported by all the County Councils along the route. The guidebook has never been out of print since the early days (when, as then a member of the committee, I drew the first, amateur maps). Parts of the route have been much improved by creating new rights of way, or bringing neglected paths back into use. In more recent years, an additional alternative route has been promoted, and signed for horse-riders and cyclists. 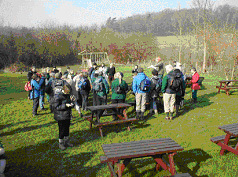 Several circular walks based on the Icknield Way have been promoted. Yet in one respect the Society has yet to achieve its aim, to have the Icknield Way designated as a National Trail. It remains the missing link between the Peddars Way and The Ridgeway, both of which have the coveted acorn waymarks of a Countryside Agency supported route. Most readers will have walked part or all of this fine path. What can we do to continue to push for its greater status (and hence maintenance, free from the constraints of County Council budgets) ? Firstly, we could consider joining the Association, whose membership has become fairly static over the last few years. We could write to the Countryside Agency with our views. We could even consider joining the committee, or acting as a warden, to look after a section of the route. Twenty years ago the prime-movers, Thurstan Shaw, Ken Payne and others, were in their sixties, and now, in their eighties, much-loved and resting upon their labours. Others were then around 40, and making time for this and other involvements in a busy working life. But now these are themselves in their sixties, and they find there is no-one following on behind, in spite of the popularity of the route. Suffolk RA Area Committee has purchased website names for all its local groups. Newmarket’s site will be going live shortly, at the address: www.newmarketramblers.org.uk There will be details of most group walks but not of social events. Ten ramblers, most from the Cambridge area, enjoyed a delightful midweek walking break in mid-September, led by David & Viv Elsom. They were accompanied by their indefatigable 12 year old sheepdog, Nell, always on the lead, and in the lead! We were based on the comfortable Kearton Country Hotel situated well up the dale at Thwaite, and ideally placed for walks at Kisdon Hill at the top of the dale, and for seeing the site of old lead-mines above Swinner Gill. David & Viv seem to know every track in this area, so following a tiny sheep-run above waterfalls led us (fairly) easily up steep terrain, whose photograph, when viewed later, made it seem impossible that we had reached the top! Lower down the dale, Gunnerside and Muker offer shops, tea-rooms, and a museum for the less energetic. One day, we drove to Hawes, to spend an hour being seduced by bargains in the lively market, before walking over the moors to Bainbridge. Another day we drove to Reeth, to enjoy a walk along Fremington Edge, and take our picnic lunch near the village of Booze! On a final half-day David organised a short circuit from the village of Marrick, while three of our number investigated the potential of the nearby golf course. Measuring the walks as in the 12 mile bracket fails to take note of a salient feature of this delightful area. Not only are there much-photographed stone barns scattered across the hillsides, the numerous small fields are divided by tall stone walls. Paths cross these by squeeze-stiles or stone step stiles. On one of the walks, we counted 86 of these picturesque impediments, surely equivalent to another couple of miles in the day, and needing a second helping of pudding in the evening to restore us! Metal, Concrete, Wood or Plastic? What am I talking about? Why, signposts, of course. ‘I have long had the feeling that different types of signposts have varying effects on the users of rights of way and on landowners. Wooden ones seem, by their inconspicuous and often “wobbly” character, to be timid and self-effacing. I imagine them wispering “Excuse me; sorry to bother you. I hope you don’t mind me mentioning it, but did you realise there’s a footpath along here?” Path users rather worried about how much confidence to be taken from this somewhat uncertain proclamation; landowners scarcely pause for thought before elbowing them out of the way! Concrete monsters, by contrast are over-bearing and town-crier like in their boasts. “You’d better believe this is a public right of way! Ignore me at your peril! Users a little overawed at their presumption. Landowners, incensed at such arrogance, rush for the nearest JCB. A large number of you now receive Cantab by e-mail. By hand, 10p is appreciated towards the cost of paper and ink. If you would like to receive an issue by post, please send a large SAE, and a 10p stamp. It has been flattering to receive several anxious enquiries this Summer as to whether recipients of Cantab Rambler have missed an edition! The answer is, “No, sorry”. There have been no Cantabs since the May edition, as your editor has been away walking in Cumbria, Scotland, Austria, and more recently in Somerset, and catching up with work at home between trips. However, here is the twentieth issue of this private magazine, which will continue to appear at intervals whilst the demand remains. Whilst many of us from East Anglia prefer our holidays in hills or mountains, relishing the contrast of scenery, and the demands of hill-climbing, I can recommend Somerset for having both uplands and flat lands. The Levels are an interesting comparison with the fens, grass & cows replacing arable fields in the wetter climate, but with some good hill-climbing in the limestone Mendips, and sandstone Quantocks. August and September finds the Quantocks glowing with heather and gorse in bloom, and dry footing everywhere. In the more popular tourist locations, the paths were excellent, with good signposting and way-marking. However, away from the “honey-pot” localities, signing of paths was sparse, and we found several overgrown stiles and hedge-gaps, to say nothing of a bridge with a large hole in the middle, and a right-of-way with a missing bridge. Each evening on holiday, we took a few minutes to compile a list of problems with grid references from our new Explorer maps. On reaching home, it did not then take too long to send 17 problems to Somerset County Council, as the responsible Highway Authority, with a copy to the Area Secretary of Somerset Ramblers’ Association. The addresses are in the Ramblers’ Handbook. Can I encourage you to do likewise with your holiday destinations? There is a strong feeling that County Councils take more notice of tourists’ complaints than those of residents, as being a source of revenue into the area. It is not only Somerset that has path problems: we can find plenty at home this Autumn. Most of you will know that Roger and I are Ramblers’ Association Footpath Secretaries for the 100 parishes of South Cambridgeshire. Generally, I regard the nitty-gritty of path problems to be rather dry fodder for Cantab which is designed to inform and entertain. However, in this issue, I seek to illustrate the repetitive problems we encounter, and ask for suggestions as to how long-term solutions might be obtained. In Cambs, the problems are no longer generally those of missing bridges, or of statutory signposting where a path leaves a county road. Path conditions are our problem – overgrowth in Summer; ploughed up paths in Winter. Here are some typical examples. Duncan Mackay of the Fen Rivers Way working party, was embarrassed to receive a complaint from the North of England from a purchaser of the guide book. The walker had started in Cambridge but only got as far as just beyond Bottisham Lock to discover considerable overgrowth on the path. He had given up, and returned from Waterbeach, and never completed the walk. This complaint, one of many, occurs after similar complaints in Summer 2002, and following promises from Cambridgeshire County Council that all would be well this year. We are told that one of the vegetation “cuts” was made during the dry weather of April, when there had not been much growth, and clearly only one more cut through the whole of the Summer was inadequate. The section of the path in Norfolk is reported as being in good condition. If Norfolk can do it, why not Cambs? While we were away, the Cambridge Evening News of 19 August published a letter from Councillor Sally Hatton of Sawston, complaining of nettles and overhanging vegetation on several Sawston paths. She wrote, “Very high nettles and overhanging branches need to be cleared from footpath 11, which runs between Church Lane and Babraham Road. Footpath 3, running between Hillside and Martindale Way needs to be cleared of overhanging branches etc, which in some cases, render it very difficult to negotiate the path.” The writer continues that these are only 2 examples of problems, which were reported to the County Council’s team 12 months ago, and still no action has been taken. I wrote recently to Cambs.C.C. complaining of the state of Footpath 6 in Whittlesford. This attractive path passes through woodland, then follows two sides of a large arable field, which has been fallow for several seasons, and had a good trodden grassy path developed along the field edges. This field has now been ploughed up, and the field-edge path with it, so that it is now actually dangerous to teter on the edge of a deep water-filled ditch, and laborious in the ploughland. This type of problem happens regularly in the Autumn, and once the path is ploughed up, the surface is ruined at least for that Winter, and several seasons may elapse before the good surface can be re-established. Yes, I received a reply. The problem had been passed to the local representative in the “P3” (Parish Path Partnership) scheme. The odds are, without badgering, I will never hear anything further, and the path will be in the same un-usable state all Winter. However, at the foot of the letter was the standard line “Should you require any more information, then please don’t hesitate to contact me”. So we e-mailed back our thanks, and asked for a monthly up-date! In early August we were in Bourn, to find that the harvest was gathered in, and already fields had been ploughed, the stubble turned in and the field “cultivated” (i.e. reduced to a fine tilth, ready to receive the seed for the next season). The law states that where a path crosses such a field, the line of the path should be “reinstated”, defined, and the surface made good within 24 hours. (But after the first operation, the farmer has 2 weeks in which to reinstate). Clearly, no reinstatement had occurred. We complained to Cambs.C.C. on 6 August but by 1 September, had received no acknowledgement or reply. This lack of reinstatement of cross-field paths happens all over the County. The Countryside Services Team send out letters of reminder to farmers in the Spring, and then tractor wheelings may appear, and the line of the path may be cut in the crop. But meanwhile the field path has been unmarked and often unusable all Winter. It is most valuable if possible to follow up path complaints by re-inspecting, and reminding. Footpath Secretaries attempt to do this, but with over 200 cases on the books, the efforts per path become diluted. Situated in the far SW of the county, the little village of Abington Pigotts is much closer to Royston, Herts, than to Cambridge. The population was 17 in the Domesday survey rising to more than 200 in the nineteenth century, but is now only about 150. The village is noted for its medieval moated sites, particularly Down Hall, along a lane to the SW of the village, with a moat, water-mill, and ancient gatehouse. Radiocarbon analysis of the latter has given it a date-range 1250-1380. The gatehouse is jettied on two sides, and has two entrances, one for horseriders and one for foot-travellers. The bell-topped lantern is said to have acted as a guide for travellers across the moor. Down Hall Manor was in existence before the Conquest, in the hands of Alwyn, The King’s Crier. In the middle of the village is the pub, now called “The Pig & Abbot” (formerly “Derby & Joan”). The name changed when a village consortium bought the property, to save it from closure: the food is recommended. There are 11 rights of way in the parish, giving reasonable access to Shingay, Steeple Morden and Litlington, but only laboriously directly to Bassingbourn across 5 arable fields (using Footpath 7, which starts up a field entrance between gardens, almost opposite the pub). Try this after harvest, or in Spring when the crops are short, or when the ground is frozen hard! Local soil is boulder clay, or chalk overlying clay. Footpath No.8 leads from 62 High Street, at the road corner, down the gravel drive in front of the house and continuing SW as a grass path with wood to right and arable to left. By the corner of the wood, “Bibles Grove”, we pass out of the parish, but a good all-weather gravel track continues SW between fields to Steeple Morden. For a very short circuit, turn off left at the corner of Bibles Grove, TL 301 440, and join the gravel track, bridleway 1, running towards Down Hall Farm, where the famous gatehouse may be inspected. From here, turn left (NE) to walk up the lane, passing a wood pleasant with primroses in Spring, and thence return to the village. Three longer options are possible from Down Hall Gateway. Option (a): turn right, (S) towards the mill buildings, then turn SE over Cheney Water Mill Stream on a wide brick bridge and go through the wooded garden of the Mill Cottage, on Footpath 5, finally emerging over a shallow ditch into an arable field, TL 305 436. The continuing cross-field path in Litlington parish is often reinstated, and nearby paths through Manor Farm, Litlington lead to the centre of that village. Option (b): continue past Mill Cottage on a grassy footpath (No.4) with Cheney Water to left. Follow this to TL 292 437 where a bridge spans the stream. Either cross the bridge and turn left for a good network of paths to Litlington or Steeple Morden, Or stay on the path to TL 296 435, where leave the field edge turning right across a narrow strip of arable field to join the firm bridleway to Bogs Gap, Steeple Morden. This route is reasonable in Winter, since the cross-field section is minimal. Option (c): continue on Footpath 4, but turn off left on Footpath 6 at TL 302 435, crossing Cheney Water by a farm bridge. The RoW follows a mown grassy track with hedge & trees to right, arable field to left, to a waymark post at TL 302 434 by the field-corner where it turns SW to continue as Steeple Morden Footpath 22 across an arable field. (This option is not recommended in Winter, as the last field is very sticky!). Note that Footpath 6 was diverted in 1987, so older maps are incorrect. Footpaths 2 & 3, leading to the N end of Steeple Morden, via Mill Hill, TL 301 440 need careful map reading, and involve some arable fields. Back in Abington Pigotts, follow the lane to the church, which has a porch dating from 1382. Bridleway 9 continues North beyond, as a pleasant wooded lane, muddy in Winter. Bridleway 10 is clearly signed, turning off left, and leading to Flecks Lane. This path is often heavily poached by horses. On Flecks Lane turn right, soon picking up a path on the right leading to Running Ditch, and thence to Shingay. A quiet narrow road leading SE will bring the walker to the signed turning for Footpath 11, first as a clear track across an arable field, then briefly along a field edge, before becoming a charming narrow trail through trees, and rejoining bridleway 9, making a circuit of ca. 3 miles from the church. Footpath News, Issue 25, April 2003 contains details of the largest estate in Britain with no rights of way. John Andrews, RA footpath worker in Suffolk, contends that this is the Shadwell Estate of 6000 acres, situated E of Thetford. It is owned by the royal house of Dubai, who breed racehorses there and also covers breckland and woodland. It seems that the pathless situation may be due to change with imminent publication by Norfolk County Council of Modification Orders for 2 byways, one of which connects with the Peddars Way. Access land claimed under the CROW Act may cause dispute..
Footpath News, Issue 30, Aug. 2003 reports on research into the economic value of walking, in a project on the value to the economy of England’s paths and access land. between £1.4 billion and £2.6 billion income is generated by walkers. Translated into employment statistics, walking supports up to 231,360 full-time jobs. I’m not sure how these figures were derived, but it sounds very impressive. How much do you spend on a day out walking? Wear & tear on equipment – I reckon it costs 20 pence every time I wear my boots! RoSPA (Royal Society for the Prevention of Accidents), in its annual report, gave the following figures for walking-specific injuries. In early May, 11 walkers (some part-time) joined the RA Cambridge Group to Bassenthwaite for its sixth visit to Kiln Hill Barn. Once again, we enjoyed the hospitality of Ken & Heather Armstrong in the comfort of their lovely old farmhouse. On the first day, 8 of us did a circuit from Greenhead, climbing the steep grass slopes of Yard Steel, and visiting Great & Little Scar Fell, some taking a deviationary route fording a stream, before re-uniting for tea at Uldale. The second walk took us from Honister to Seatoller, over Dale Head, High Spy & Maiden Moor, a splendid ridge walk. Day 3 took us to Buttermere, and up Haystacks via Scarth Gap. The next day was wet at first, so a lower woodland walk was planned from Whinlatter, through woods and by the shore of Bassenthwaite Lake back to the farm, only to prove the hottest day of the week! We had more typical damp weather for the last two days – just four souls and Nell, the dog, braved the rain for a circuit from Howtown onto Red Knott, while the wiser shopped in Keswick. The last day was memorable not just for the rain, but for blustery winds, which made the ascent of the modest Knott Rigg up Newlands Pass quite exciting, but we were finally rewarded for our persistance with acres of bluebells in Rannerdale in sunshine. This was the sixth group trip to Bassenthwaite, and we think the last, having led some 36 walks without repetition, or travelling too far.. Thank you to all those who have joined us over this period – the time has come to seek a new venue, when we hope you will come with us again. Price 10 pence where sold © Janet Moreton, 2003. 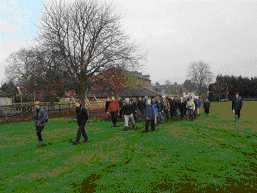 This year, The Cambridge Rambling Club had the bold idea of a YHA weekend in Norfolk at the end of January. Jill Tuffnell organised a very pleasant break, staying at Wells-next-the-Sea, in a new hostel, splendidly converted from a former school, and open in Winter only for pre-booked parties…Good walking was enjoyed by all, both on the coast, and inland on the mostly sandy paths, providing a pleasant escape from the sticky boulder clay of Winter Cambridgeshire. But we were lucky – one weekend later, and we would have been caught in snowstorms! Roger & I so enjoyed this trip that we visited the North Norfolk coast again in March, this time staying in a guest house in Weybourne, for as little as £15 per night. Again, the walking was excellent, with better signposting and waywarking than I remembered from a few years previously. I would give two tips to other ramblers. Many villages have display boards showing “Community paths, and other Rights of Way”. I am not sure of the subtle differences in Norfolk’s classifications, but it is worth annotating your maps, because there appear to be both diversions and additions, some not shown on the recent Explorer sheets, and certainly not on the older Pathfinder series. The other relates to FOOD. Norfolk’s tourist industry does not come alive mid-week until Easter, so take food and drink with you for mid-day. The pub you seek may have closed, and the cafe may say, irritatingly, “Open at the weekend”, and this in the presence of coveys of birdwatchers! These breaks have inspired a Norfolk issue of Cantab, and I am very grateful to John Capes, long active in the Cambridgeshire rambling scene, for recalling for us his childhood in Norfolk, and conjuring up its atmosphere, in his delightful article on Paston. Ask a rambler where they have walked in Norfolk, and the odds are the response will be, “The Peddars Way, and Norfolk Coast Path”. The National Trail has recently been decorated with sculptures. One is invited to “look at the sculptures carefully, to find hidden images that link with the book, A Norfolk Songline”. Book & CD by Hugh Lupton & Liz McGowan, from Hickathrift Books, 8 Church Terrace, Aylesham, NR11 6EU. Tel 01263 515900. Norfolk CC produce an A2 folded sheet for the Nar Valley Way LDP, which we walked in mid-Winter 2000. We followed the waymarked route some 30 miles from Kings Lynn to its source near Gressinghall, visiting ancient sites at Wormgay, Pentney Abbey, Narborough, West Acre & Castle Acre, and the old round-towered churches of E. & W. Lexham, overnighting in warm guesthouses. This interesting 56 mile LDP runs from Cromer to Great Yarmouth, taking in an attractive disused railway line along its middle section. Norfolk CC (Planning Office) at Martineau Lane, Norwich, made an attractive A2 folded route sheet available since 1999. The route is now also illustrated on OS Explorer sheets. For those who want circular walks for a long day out, we have found inspiration in “Norfolk Heritage Walks” publ. 2000 by Norfolk RA, £2.10. We extended their Walk 7, Sheringham Two Priories, Beeston, and Weybourne, to enjoy an excellent day, following precise notes. Mel Birch’s “Historic Walks in Norfolk” (publ. Images, 1988) may no longer be in print, but has the right blend of instructions and historical notes. We particularly enjoyed a walk visiting Baconsthorpe Castle, near Holt. A display board at the site also describes an 8 mile circuit. Finally, we would endorse John Capes’ choice of the OS Pathfinder Guide for Norfolk & Suffolk. Last year there was some controversy in the Cambridge Evening News after it was claimed that Castle Camps was the highest village in Cambridgeshire, with several people writing to the editor to point out that this was not true. I had known for several years that the highest point in the county was in Great Chishill, but did not know precisely where. So I contacted the Ordnance Survey to find out the exact height and location. At first their Information Section said 142 metres, but after I pointed out that there were 145 metre contours on the maps they consulted their Survey Section and eventually sent me a letter and map pin-pointing the height as 146.3 metres at Grid Reference TL 42738 38546. This places it in the centre of the B1039 opposite a row of houses about 150 metres south-east of the entrance to the recreation ground. Note that the Grid Ref of 427 380 given in the March Cantab Rambler appears to be below the 145 metre contour shown on Explorer 194 (Hertford and Bishop’s Stortford). Many thanks John, for exact information. The data in the article on Chishill in the March 2003 issue of Cantab was obtained from Paddy Dillon’s “The County Tops of the British Isles”, publ. by Gastons-West-Col, 1985. p.23, which gives 146m (480ft). Clearly, some more precise surveying has been made recently. Many thanks for the Cantab Rambler. I enjoyed reading it. You ask whether your readers would prefer an outline leaflet with basic instructions or a more elaborate booklet. Personally, I would like both!! If the basic leaflet would be the descriptions of the walks which you already have on computer, maybe this would be pretty simple to produce. I think a more elaborate booklet would be great. The Fen Rivers Way one seemed to be very popular. I would certainly buy one and I’m sure others would too. I really like the series of Cambridge walks booklets and dip into them all from time to time. I like walking books almost as much as maps! I do keep walking guidebooks on a special shelf and revisit walks or parts of walks I have done and enjoyed and I just enjoy planning where I might go sometime. I also have quite a number of walking guidebooks of places I have never visited but would like to one day – such as Offas Dyke. Thank you for organising the West Anglian Way walks. I can honestly say that I enjoyed every one of them. It was so interesting to meet, talk and walk with people from other groups. Also I managed to use the train on all except one of the walks. Glad you could come, Barbara, and your thanks go to the several people were involved in the arrangements. Regarding the guide, progress so far is a draft route description for all parts of the full walks. We would like to compile some additional notes for those who would like shorter sections. It is now 40 years since I left the village of Paston in north-east Norfolk where I was brought up, but I still remember all the houses, fields, tracks and hedgerows that make up that small rural community. I was actually born in my grandparents’ bungalow in the next village of Knapton, and then lived for my first year in another neighbouring village of Edingthorpe, but it is Paston that I regard as my ‘home’ village. It is a very small village, in my youth there were about 300 inhabitants, it is probably much the same now – not much has changed there in the last seventy years, when I was last there two years ago only one new house had been built since I left! It lies about half a mile inland from the coast between Mundesley (to the north) and Bacton. The village is arranged mainly around a rough rectangle of roads, a mixture of council houses and ex-farm-workers cottages. There was a shop and post-office at one corner, but that is now closed. From one corner of the rectangle is a loop road on which stood the vicarage, now a private house, and two other larger houses. There are several small groups of properties scattered around on the roads leading out of the village, one such group being about two miles away, nearly to North Walsham. There were three farms in the village, now reduced to two. 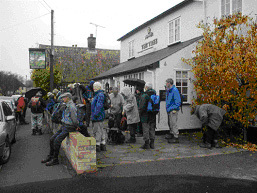 There used to be a village pub, The Wherry, but it was over 2 miles from the village centre on the North Walsham and Dilham Canal, also long since defunct. There was a builder’s yard and a blacksmith’s forge. The builder has gone, but a couple of years ago the forge was in use again by someone doing wrought-iron work. 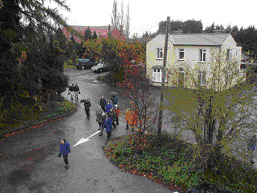 The school that served the village stood just in the neighbouring village of Edingthorpe, just over a mile from the centre of both villages. There are three buildings of note in the village. The rather nice thatched church is dedicated to St Margaret, which contains some tombs of the Paston family, but the main things of note are two mediaeval wall-paintings; one a ‘Doom’ painting – the three living and the three dead, the other of St Christopher. But the church is rather over-shadowed by the magnificent 16th century thatched barn just across a farmyard. This was built by Sir William Paston in 1581 and has some really splendid roof timbers, with alternate crossbeams and hammer beams. It is one of the three great barns of East Norfolk; the others being at Waxham and Hales, the latter is the largest and I think the earliest as it dates to the 15th century. The Paston barn is often quoted as a tithe barn, but it never was. In the Eastern Daily Press of 15th September 1925 there was a report of a visit to the village in that year of the Norfolk and Norwich Archaeological Society, which stated, “The old tithe barn was pulled down fifty years ago. The Elizabethan Barn was never called the tithe barn”. Then there is the windmill, sitting proudly on Stow Hill on the road to Mundesley. It is often captioned in photographs as Mundesley windmill, but it is just within the Paston boundary. It was built in the early 1820s; it last milled in about 1930, and the mill-stones were then removed; and was restored in 1961. Mention Paston and a lot of people think of the famous Paston Letters, but these were not really about the village. They were written by members of the family, over some three generations in the 15th century, and sent mainly from their other properties at Oxnead, Caister, Norwich and London. The letters are considered to be one of the best records of the private social life of the period. So there is the village, but what of the local landscape, and for ramblers the rights of way? The parish has always been very agricultural, and as a youngster growing up there in the 1930s, I and most of the other village children, roamed the fields fairly freely, as long as we didn’t spoil the crops, but we knew where we could go at the different times of the year. The landscape is gently undulating, as is much of Norfolk. The flat parts are mainly at the eastern and western extremities; the Fens being near King’s Lynn and the Broads and marshes near Great Yarmouth. Our explorations often involved going to see what the farm-workers were doing in the fields and thus we got to know just about every twist and turn of the various fields around the village. Although we could more or less go at will we often used the tracks and paths, but actually there were not many of these. We had a vague idea that some of these were for public use and others not, but it didn’t really matter as everybody in the village seemed to use all of them. There were four tracks leading to the cliffs, the one nearest to Bacton was well used because it led to the only easy way down the cliffs to the beach, but it was not a public track. It made the start of a very pleasant cliff walk towards Mundesley, but this track is now under the Bacton Natural Gas Terminal. The very lovely hedge-lined lane from near the vicarage was public with a footpath to the cliffs from its end, but unfortunately it was destroyed in the late 1930s to make the fields larger and more suitable for modern machinery! However, it has remained a public path. Towards Mundesley was another (private) farm track, but I used it a lot. Then lastly from opposite the windmill was the Yarmouth Road. Even in the 1930s this stopped at the cliffs, but in times past it had been the main coast road to Great Yarmouth, so it was public (it shows as a ‘white road’ on OS maps). This latter track led to Mundesley Holiday Camp – in Paston of course! The holiday camp caused a bit of a furore in the 1960s when they put a gate across it, but my father, who was chairman of the Parish Council at the time, soon got to grips with that and the gate was removed. There are no footpaths near the village centre – there was one but that was closed when a new stretch of road was built in 1936. Some distance from the centre are two cross-field paths one from the North Walsham road across to Knapton, the other to Edingthorpe Church. However, at the far end of the village, towards North Walsham, there are several paths and two RUPPs (the latter may by now be re-classified). There is now a marked route known as The Paston Way, which runs from North Walsham to Cromer and is shown on OS Explorer 252 (25). What of the general walking scene in Norfolk? I suppose that a disadvantage for many people is that it is agricultural, and with no hills of note. For me this does not matter, having been brought up in an agricultural village I am always interested to see what the farmers are doing. Paths obstructed by crops can be problem, but in our walks in Norfolk during the past three years Tessa and I have found stiles are the main cause for concern: we found a particularly hazardous one near Oxborough recently. Where to walk? The coast is always attractive, there is a good one from Cromer along the cliffs to Sheringham, with a tremendous view of the latter from Beeston Bump; the return is then along the high ground just inland near the highest point in the county at Beacon Hill (102metres). A few years ago I was given the Norfolk and Suffolk Pathfinder Guide book of walks and Tessa and I have done 27½ of the 28 walks in it (the half left over is in Suffolk). This has a very good range of walks. One that stands out starts from Holkham and involves walking along the beach, and goes through Burnham Thorpe – the birthplace of Horatio Nelson – and The Hero at Burnham Overy Staithe does a very good crab salad! If you want something different walk across the Halvergate marshes to the Berney Arms pub by the River Yare – must be the most remote pub in the county, it’s only open in the summer to cater for the river trade, the only road access is by a dirt track; or you can walk to it along the bank of Breydon Water from Great Yarmouth. If you fancy another unusual pub, walk from Blickling Hall round to the Walpole Arms at Itteringham. Another walk we liked was from Castle Acre along part the Nar Valley Way. What about things to see on walks? An outstanding feature of Norfolk is its churches, many of which are worth investigating. That of St Peter and St Paul at Knapton, where I was baptised, has a wonderful array of angels adorning the roof timbers, reckoned as one of the best in the whole country, but in Norfolk those at Cawston and Salle rival it. At Trunch, next door to Knapton, there is a most splendid carved font canopy. To see some superb flint work look at the porch of St Mary’s at Pulham St Mary near Diss. Then there is the famous painted screen at Ranworth. One special feature of Norfolk church architecture are the round towers, there about 150 in the county, easily more that the rest of the country put together – Suffolk has about 60, Essex just six, and of course Cambridgshire has only two – Bartlow and Snailwell. Why are they round? One story is that there no corners in which the Devil can hide; but the real reason is much more practical; Norfolk has no building stone and corners cannot be built from flint! Norfolk is under-rated as an area for walkers, go there, and enjoy it. The Paston Letters: a selection in modern spelling, edited by N.Davis, World’s Classics Edition, OUP, 1961. The Paston Way: 14pp A5 booklet, first published by Norfolk C.C. in 1997. 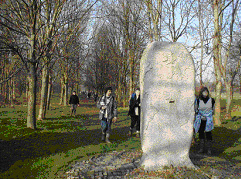 Norfolk & Suffolk Walks – Pathfinder Guide First Published 1991 by Ordnance Survey & Jarrold Publishing.